Material: Optic Crystal Top, Black Crystal Base unattached. Our Above and Beyond award is a tribute to leaders who give maximum dedication and commitment to their calling. 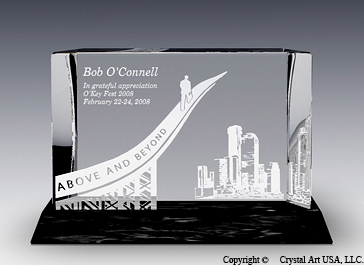 This crystal plaque is set on a black crystal base and features an engraved image of an individual standing over a bridge in to the future. In the background a city he/she has concurred is glimmering with sparkling lights.